I was writing in recent weeks about the English Radical MP, John Bright (1811-1889), and his friend, the banker and philanthropist George Peabody (1795-1869), who regularly visited Cruise’s Royal Hotel, Limerick, and Castleconnell, Co Limerick, during their fishing holidays in Ireland in the 1860s. 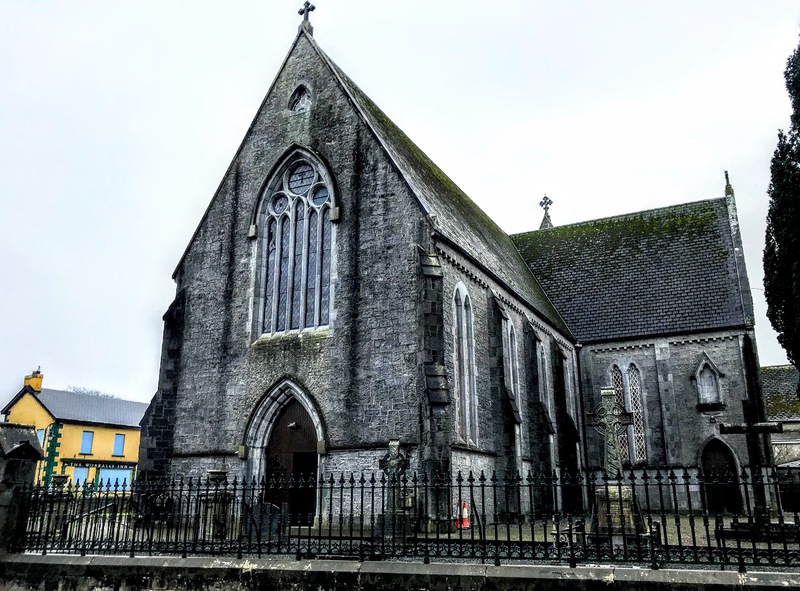 Both men were enthusiastic about Castleconnell, and Peabody was so enamoured with the place on the banks of the River Shannon that he later paid for the iron railings around Saint Joseph’s, the Roman Catholic parish church. 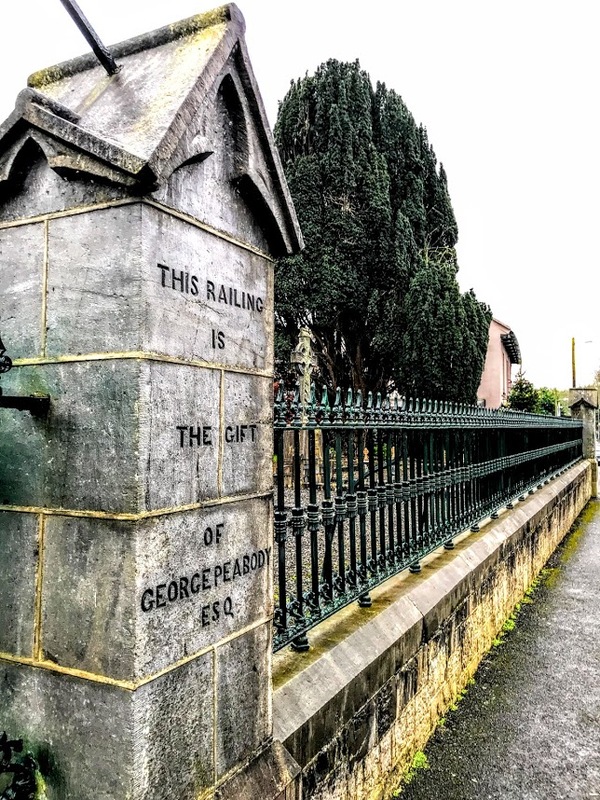 Some weeks ago, I went in search of Peabody’s railings, but instead was distracted by Worrall’s End or World’s End, with its weir, quay and rowing-club on this stretch of the River Shannon. I then ended up at Gardenhill House, east of Castleconnell, once home to some members of the Comerford family. Owen Comerford (1869-1945) died at Gardenhill House on 15 June 1945 after he had gone to live there with his daughter, Nora Kathleen (‘Norrie’), and his son-in-law, James Henry Montgomery. 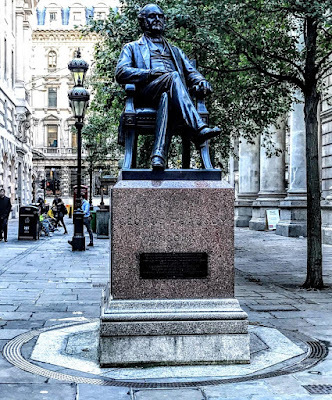 When I was in London last month for a meeting of the trustees of the Anglican mission agency USPG (United Society Partners in the Gospel), I was reminded of that search for Peabody’s church railings in Castleconnell when I came across a monument to George Peabody in the City. 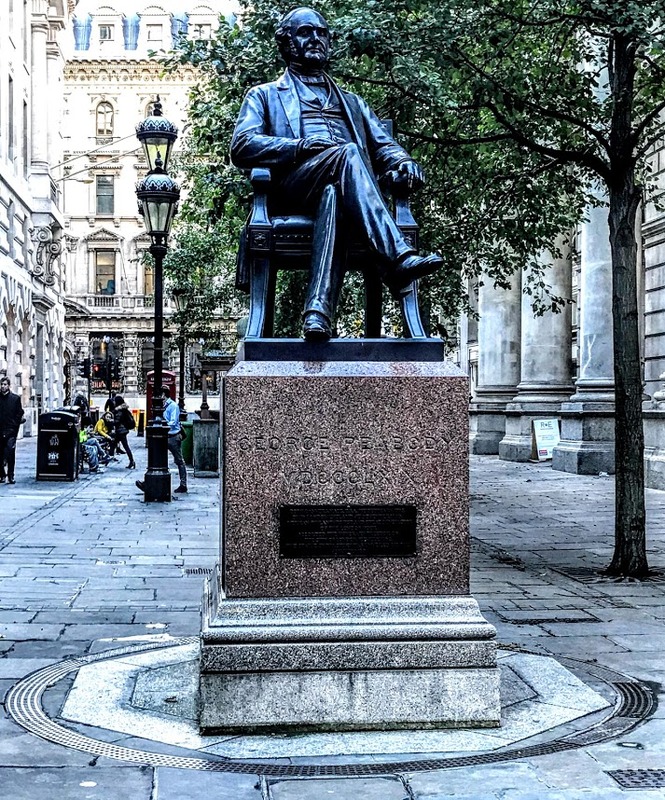 Peabody’s statue by the Royal Exchange, facing onto Threadneedle Street and close to the Bank of England, was made in Munich 150 years ago in 1867-1869 and was unveiled on 23 July 1869, just a few months before he died on 4 November 1869. The engraving on the front of the granite plinth reads: ‘George Peabody MDCCCLXIX’. The statue was unveiled by the then Prince of Wales, later King Edward VII. It was almost unprecedented as a ceremony, for the subject was still alive, and this remains one of just a handful of London statues erected in the lifetime of the person commemorated. Peabody was too ill to attend the ceremony and he died three months later. 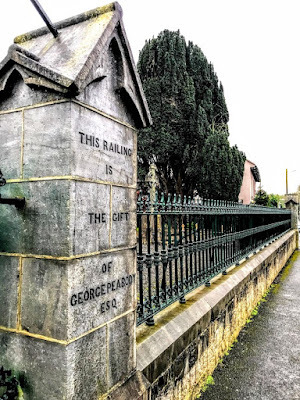 On the journey between Dublin and Askeaton last weekend [16 December 2017], two of us decided to stop once again in Castleconnell and look once more for Peabody’s railings. In the 19th century, Castleconnell was known for its fishing; the main catch was salmon and trout, and the Shannon Inn was well known for its fishing clientele over the years. John Bright and George Peabody went fishing for salmon at Castleconnell in June 1867, and again in July 1868. Castleconnell is sometimes known to its parishioners as the ‘Island Parish.’ It is bounded on one side by the River Shannon and on the other sides by the Diocese of Cashel and the Diocese of Limerick. It is the only part of Co Limerick in the Diocese of Killaloe, which is mainly in Co Clare and north Co Tipperary. At the end of the 17th century, the mediaeval names of Stradbally and Killeenagariffe by the parish names of Castleconnell and Ahane. Saint Joseph’s Roman Catholic Church was built in Castleconnell in 1863. 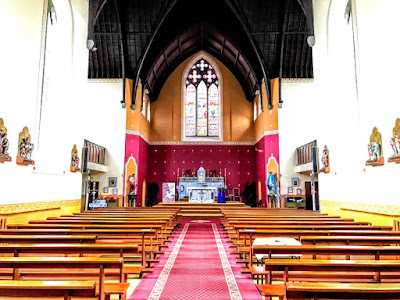 The church is designed in the Gothic Revival style by the Limerick-born architect William Edward Corbett (1824-1904). His other works in Limerick city and county include Mount Saint Alphonsus (1858-1862), the Redemptorist church, the Jesuit Church of the Sacred Heart in the Crescent, and the Franciscan Church in Henry Street, and he also designed the Tait Memorial Clock in Baker Place, Limerick. In designing Saint Joseph’s in Castleconnell, Corbet was influenced significantly by Philip Charles Hardwick (1822-1892). Corbett had worked with Hardwick for the previous decade, including working together of Adare Manor and at Saint Alphonsus. Saint Joseph’s was built by Launcelot Ryan of Newport and Limerick. Saint Joseph’s is a gable-fronted cruciform-plan church, begun in 1863, and was dedicated on 9 August 1863. The church has a four-bay nave, transepts and a chancel, with an extension on the south-east side and two-bay single-storey lean-tos at the north-east and the south-west. The church also has cross finials, and an open work bellcote. Inside, there are pointed arch blind niches in the transepts, limestone hood-mouldings, trefoil-headed openings with carved plinths, stained glass windows, triple lancet windows in the transepts and a chancel clerestory. The church has a particularly fine scissors truss pine roof and timber galleries. In 1864, Helenus White of Belmont House presented the High Altar to the church. The site in the centre of Castleconnell was given by Sir Richard De Burgho of Island House, who also donated £40. 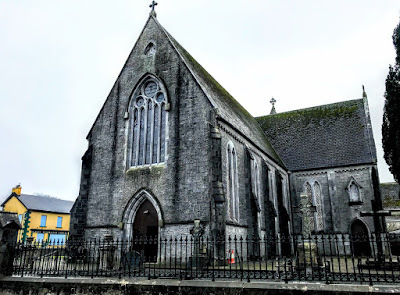 Much of the building costs for the church were met by Richard Hobart FitzGibbon (1793-1864), 3rd Earl of Clare, who lived nearby at Mountshannon, and whose only son and heir, John Charles Henry FitzGibbon (1829-1854), Viscount FitzGibbon, had died at the Battle of Balaclava in the Crimean War. When Lord Clare died in 1864, the family titles became extinct, and Mountshannon was inherited by his daughter, Lady Louisa Georgina FitzGibbon, who married a Sicilian nobleman, the Marquis della Rochella. Later that decade, John Bright and George Peabody visited Castleconnell in June 1867, and again in July 1868, and went fishing for salmon at Castleconnell. Bright was popular in Ireland, helped to shape working class politics and was a prominent member of the Society of Friends (Quakers). When Bright and Peabody arrived in Limerick in 1868, the welcoming committee at the rail station included two local MPs, William Monsell (1812-1894), later Lord Emly, and Sir Stephen Edward de Vere (1812-1904) of Curraghchase and Foynes Island, and the Limerick historian and journalist Maurice Lenihan. Despite this story, Peabody was a generous philanthropist, and he funded the erection of the ornate piers and wrought-iron railings at the church. However, some accounts claim he was trapped into the paying for the railings. On his arrival in Castleconnell, the story says, the parish priest, Father Patrick Hennessy, organised a welcome party for Peabody at the railway station, with a great bonfire fed principally by the old wooden railings that had surrounded the church. When a visiting diplomat told Peabody of the fuel that fired the welcoming bonfire, the American millionaire ordered the new railings. The railings are a prime example of the level of craftsmanship of traditional Irish blacksmiths in the 19th century. The railings feature cast iron decorative features that are leaded in place. An arched wrought iron lamp holder spans the entrance gates with four decorative scrolls. The railings are installed on a limestone plinth and leaded into place. Arched wrought iron stay-bars were put in place behind the railings to help keep them upright. 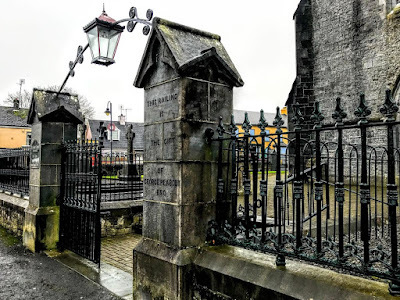 The railings were repaired and restored in 2014 by the traditional heritage blacksmith Brendan St John of St John Forge and Ironworks, Drangan, Thurles, Co Tipperary. A new lamp-holder was designed by Sheena Ryan, based on research on lamp holder styles from the period. We have just five days to go to Christmas Day. 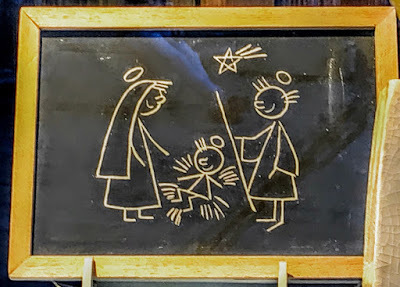 Sunday was the Third Sunday of Advent, and this is the last week of Advent. Give thanks for the Nurse Training School at Bollobphur Hospital, which provides local women with a profession so they can earn an income and help to support their families. 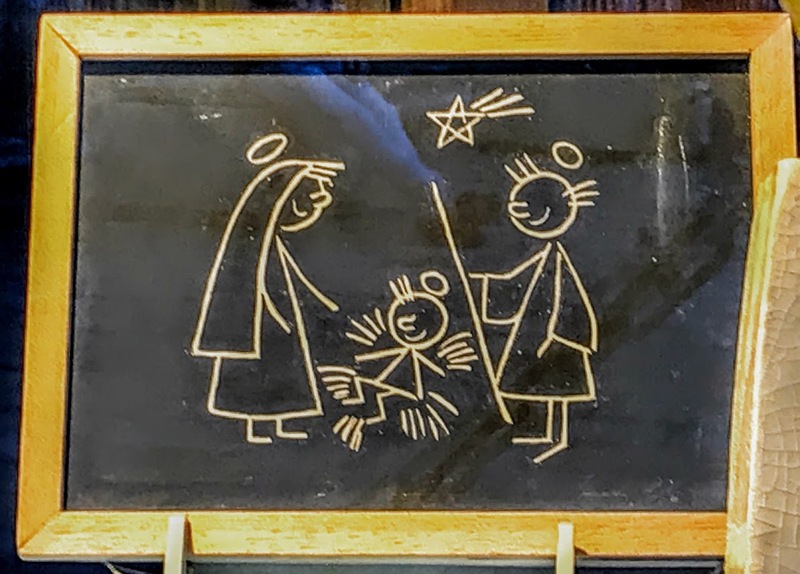 Today, the calendar is headed ‘O Clavis David,’ referring to the fourth of the O Antiphons in the final week of Advent. Today, the calendar suggests reading Luke 1: 39-45. Pray for all who are about to give birth. Pray for children born into danger. Pray for society to honour the new born and delight in them. Isaiah 7: 10-14; Psalm 24: 1-6; Luke 1: 26-38.